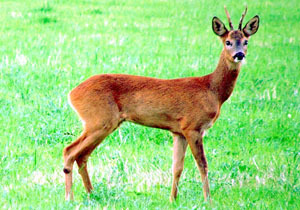 There are six species of deer to be found in the U.K. – two of which are considered native – Roe Deer and Red Deer. The other species, Sika, Chinese Water Deer and Muntjac have been introduced in the last 150 years – and the Fallow deer is often accepted as part of our natural heritage as it was introduced back in the 11th Century. The range of Roe Deer (Capreolus capreolus) has extended considerably in the last 40 years, as have the numbers of Roe Deer. The natural predator of the Roe Deer is the lynx, but this does not exist in the wild in the U.K – so the population has had one control on its numbers removed. 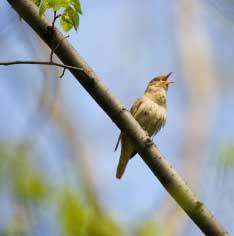 There has been concern about their impact on woodlands and the natural environment in general. Previous studies have focused on deer damage (in general) using, for example, data from 80 Sites of Special Scientific Interest. Now work is being undertaken by a team from Durham University and FERA (Food and Environment Agency) but focusing specifically on the effects of Roe Deer populations. They have collected information on Roe Deer numbers, along with data on vegetation at 35 different sites (during 2011 and 2012). Their sites are also some of the field sites for the Breeding Bird Survey so that the researchers also have access to extensive data on bird numbers. Sites with the higher numbers of native animals (Roe Deer) have a poorer shrub vegetation layer, and lower number of birds – that is the roe deer are causing a reduction in the number and diversity of plants (and therefore birds, as they have less to feed on -berries, insects etc). Roe Deer are associated with or collect in woodlands with open shrub layers – that is woodland areas with depleted vegetation ‘attract’ roe deer. 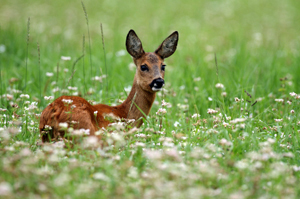 Georgina Palmer of Durham University is continuing to work on the data to determine whether it is the roe deer that are actually responsible for the loss of vegetation and birds. Around half of the UK’s deer population needs to be shot each year to stop extreme devastation to the countryside, scientists claim. Deer are a wonderful assett and are a delight to see in the woods. However, it is essential that the population should be managed to avoid problems. The only correct way to do this is by a qualified deer stalker. A population census and deer management plan should be agreed upon. The deer can then be humanely culled in the appropriate season. Failure to do this will result in over populations which will lead to increased road traffic accidents, damage to flora,disease,and conflict with farmers and foresters. Replanting and coppice management will be compromised. Of most importance is the poaching problem which uncontrolled high deer densities will bring. Rest assured there are plenty of criminals who will poach the deer with lamps dogs, and shotguns whilst you are away. Far better is to have someone on site who knows and understands deer, is qualified and safe. The venison is prime healthy meat and nature`s natural harvest. Remember the stalker should be qualified to DSC1 and DSC2 and should prepare a comprehensive sustainable deer management plan. You can now enjoy the deer in your wood without compromising the environment which both we, and the deer share. Unfortunately nature is almost never kind or fair. Population control in nature occurs generally by predation, starvation or disease. Surely humane and controlled predation (by man) is preferable to overpopulation that leads to death by these other means. It is interesting that a human parallel has been drawn. Are you implying therefore that the Ethiopian famines in the 80s were beneficial or a good thing? The famine and resulting disease certainly did control the population which had outgrown the lands ability to provide sustenance. If you transpose this scenario to a wild deer population, would this be a better option for the deer rather? If you think Roe Deer are destructive, check out what the Red Deer do in the Lakes…….. and elsewhere……. I don’t find that particularly palatable either. We are overpopulated with people, that should be addressed. It seems to be, as usual, just negative – just what I would expect from this government… there is an interesting comment right at the end in defence of deer. I would not like to be sitting or meandering in my bit of peaceful woodland to have that shattered by guns killing wildlife – human beings are the problem – we have taken away so much of the natural habitat, pushing animals into smaller and smaller spaces – we need to learn some compromise. We do not have the monopoly on this earth though anyone looking on would think so. I say leave the animals alone and if you cannot co-exist with them then go live in the town. This is worth a read about the effects of the ever increasing deer populations in the UK. I think great effort must be directed in preventing deer damage, rather than killing deer. I am very much against this and it seems a very brutal solution which does not chime with being amongst the native woodlands, and nature. It fills me with horror to be honest. Why do we need to shoot deer in British woodlands?